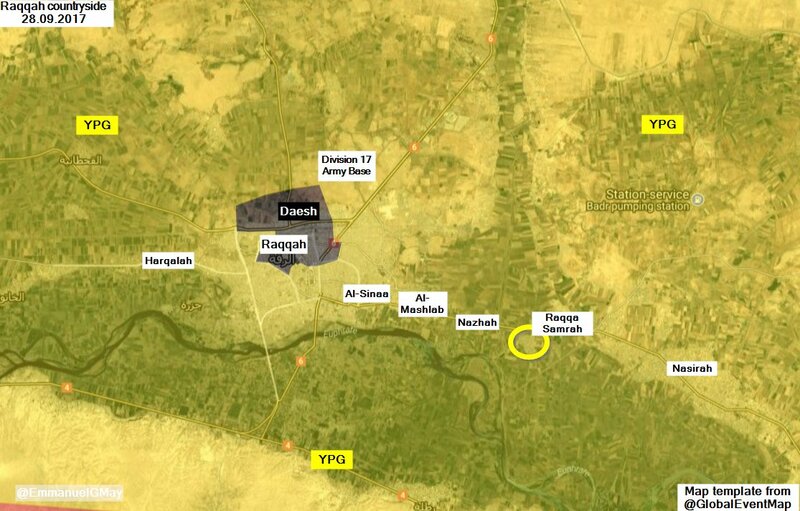 The Syrian Democratic Forces continued its progress against ISIS in Raqqa city and its surrounding areas after repelling the ISIS infiltration attack by recapturing the village of Samra. The SDF reached the outskirts of the white garden while heavy clashes took place, it is expected to be captured in the upcoming days. Meanwhile, ISIS forces used different ATGM to attack SDF forces inside the 17th Division base. ISIS also reported that US-led airstrikes killed at least 30 civilians. Yesterday we commented the degree of destruction of Raqqa city. 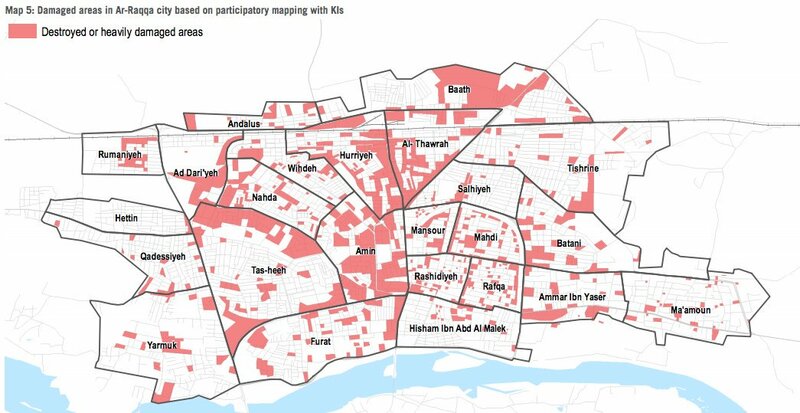 The following map shows the degree of destruction of Raqqa city main districts. The level of destruction is even worse than Aleppo city eastern districts. Civilians were allowed to enter their homes in Jazra neighbourhood (westernmost districts) after SDF checked out their homes. Some reports announced that 35 SAA soldiers defected to SDF after ISIS attacked their positions in south Raqqa. Clashes between Ahrar al-Sharqiya and other opposition groups took place on the outskirts of Al-Bab city. Meanwhile, a new hospital is being built in Al-Bab with Syrian-Turkish coordination. Multiple Russian and government airstrikes were carried out in Idlib governorate. Abu al-Duhur airbase was targeted again, as well as its adjacent village. Other areas targeted include Idlib, Maarrat al-Numan, Khan Shaykhun and Jusr al-Shugur, among other areas. A Turkey-Russian ceasefire agreement will enter into force tonight at 00:00 am. This shows that the situation, at least in Idlib area, is managed between international powers and its not managed between local and government players. Government artillery targeted multiple villages, including Kafr Zayta and Al Lataminah. Some social networks government profiles claimed the death of two government pilots, which would suggest that the claim made by opposition forces was true -yesterday we considered a hoax due to lack of evidence. A huge amount of heavy weapons, anti-tank weapons, suicide vests, silenced weapons and munitions was captured by government forces in a failed attempt to smuggle them into Hama city for possible sleeper cells. More information in this video here. Syrian Arab Army captured Shuwayhah from Islamic State in the central Syria ISIS-held pocket. Meanwhile, SAA airforce targeted Al-Hardana, Suha and Abu Habilat in eastern Hama countryside. A huge ISIS offensive took place tonight on the Sukhnah-Deir ez-Zor road. The initial attack managed to capture multiple hills around Sukhnah city as well as all the checkpoints between Sukhnah and Shoula. The territory captured by ISIS includes Shoula, Kabejeb, Abu Omar and Al-Jabaliyah. 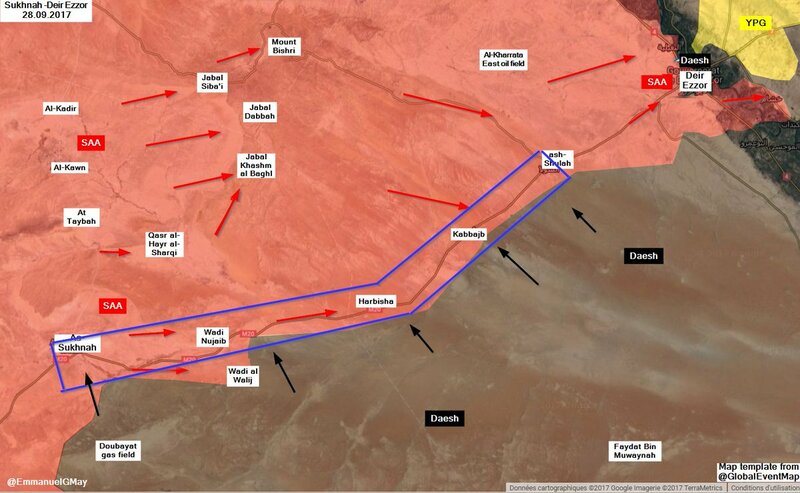 Clashes also took place in Bir-Ghabaghib and Sukhnah, which is under ISIS fire control (still under SAA control). The Islamic State called this new offensive “Battle of Sheikh Abu Muhammad al-Adnani and its intentions are to capture the whole east Homs area lost to SAA, and to lift the siege on ISIS forces in central Syria. First attacks gave ISIS fast advances and some civilians inside Palmyra started to evacuate the city as they feared it could fall again into ISIS control. This offensive already killed an unknown large group of SAA soldiers, initial reports suggest that it could reach 100 SAA casualties. Another tunnel bomb was detonated by Faylaq Al-Rahman in Ayn Terma with unknown casualties on the government side. A preliminary list appeared on social networks with at least 10 government soldiers dead. On the government side, the SAA forces targeted with artillery and missiles the areas of Ayn Tarma and Jobar. Heavy clashes took place between the “Union of Hermon Mount Forces” and SAA, as the latter tried to advance north of Beit Jin backed by the Syrian Airforce, artillery and attack helicopters. The Syrian Arab Army and its allies pushed towards Hatlah Fawqani and captured new points close to the village, which is located on the Euphrates’ eastern bank. 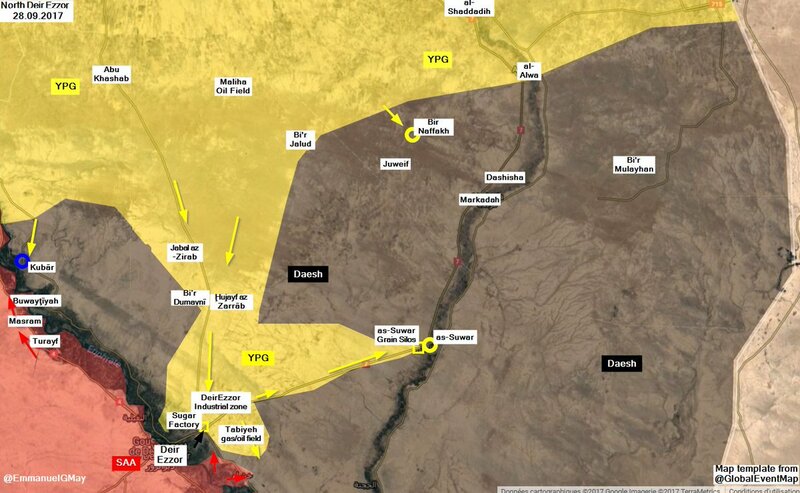 On the SDF side, the US-backed forces captured Suwar and Bir Naffakh town from ISIS and started to launch attacks on ISIS positions inside Kubar. The Islamic State leader Abu Bakr al-Baghdadi is still alive after a new audio message made by al-Baghdadi proved he is still alive. The US envoy Brett McGurk said this kind of message shows a weak ISIS ruled by a cowardly and losing leader. On the 27th of September 2017, CJTF-OIR has conducted 35 strikes in Syria. CJTF-OIR‘s main focus in Syria is Raqqa region where they did 33 strikes supporting SDF‘s operations against IS destroying 23 fighting positions, a vehicle and an ISIS headquarters; and suppressed three ISIS tactical units. Another area where two strikes occurred is Deir ez-Zor destroying four ISIS supply routes and an ISIS headquarters. The full report on CJTF-OIR strikes conducted in both Syria & Iraq can be found here.